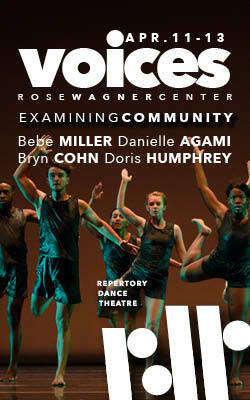 Ririe-Woodbury in Daniel Charon’s Exilic Dances. Photo courtesy of Ririe-Woodbury. Sept. 28-30, Ririe-Woodbury’s six artists undertook the task of creating for their audience a sense of Parallax — the effect whereby the position or direction of an object appears to differ when viewed from different positions. What ‘object’ was the viewer intended to see differently: the idea of contemporary dance, the bodies of the artists, the company’s canon? One thing this viewer saw differently was the aesthetic range of the six-member company, illuminated by the curation of three unique dances and their staging. 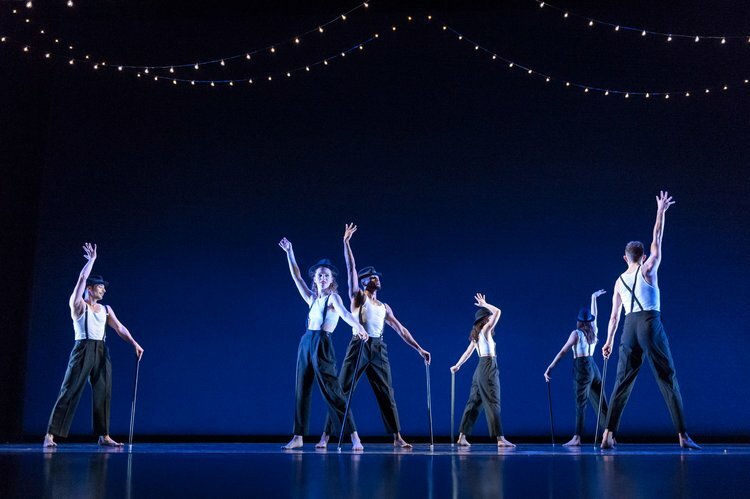 The evening’s works — a restaging of Kate Weare’s Unstruck (2015), the world premiere of artistic director Daniel Charon’s Exilic Dances, and Raja Feather Kelly’s Pantheon — required much adaptability from the dancers, which they ably delivered. The pieces were thoughtfully staged with lighting by Cliff Wallgren and Mike Faba (Unstruck), and striking costume design by Laura Kiechle and Brooke Cohen (Unstruck). All three works were presented with careful attention to shifts in the framing of wings, scrim, and stage that affect what we notice. Yebel Gallegos and Melissa Younker in Kate Weare’s Unstruck. Photo by Stuart Ruckman. The curtain rose on Unstruck with Megan McCarthy and Mary Lyn Graves facing each other, backs undulating on a dimly lit stage. Joined shortly by Dan Mont-Eton, they wove between duets and trio, three islands floating together around the proscenium sea. 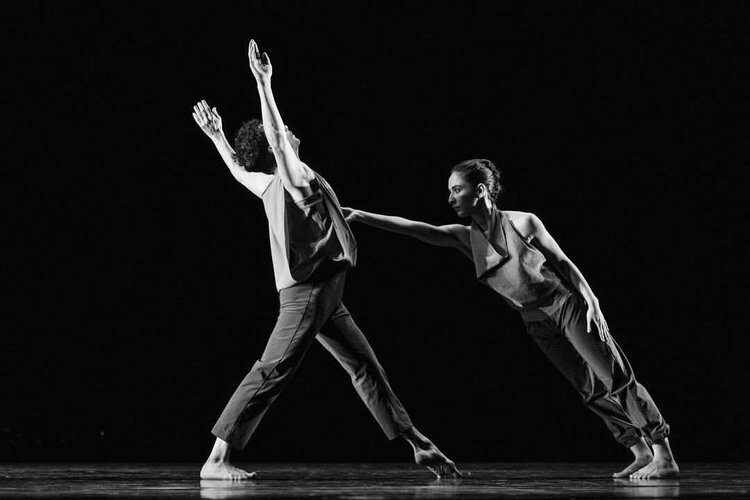 Weare’s masterful movement invention and use of the performers’ strong ballet technique kept me engaged at every surprising lift, light slap, and sensual touch. It was a dance of saltwater taffy, each pull stretching the trio into a new relationship. As Unstruck neared its conclusion, the three walked in perfect unison toward the wing, glimpsing at the exposed wall behind each step, above their heads a box of white light. I had the sense of not only witnessing the journey of the performers but of joining them in it. Ririe-Woodbury in Charon’s Exilic Dances. Photo by Stuart Ruckman. 1. Dancer bodies: the performers’ eclectic tattoos that were highlighted by their white underpants, wigs, athletic socks, and tennis shoes. 2. Dancer labor: the obvious fatigue and heaviness of the dancers rounding the bend on their second show of the day at the conclusion of the weekend-long run. 1. Melissa Younker lying in a pile of red confetti, under spotlight, the rest of the cast surrounding her with crossed feet, jumping back and forward in syncopation. 2. Dancers folded forward with legs wide, gently bouncing their hips up and down in the kind of pop culture reference that Kelly mentions in his program notes. 3. The de-evolution of humans slowly passing from stage left to right, movement from standing — crawling — squirming. Perhaps because of the promises contained in Kelly’s extensive program notes, I longed for these images or their framing to lead me on a surprising journey or to culminate in an unexpected conclusion. Instead, the work felt predictably postmodern. Images, stitched together by a recurring running motif and a very extended series of each dancer slowly putting on brightly colored silk dresses, were overlaid by text excerpts describing the sorrow of fame and names of celebrities who have overdosed or committed suicide. At the end — death in the spotlight. Celebrity life is tough, Kelly seemed to say. You betcha. Parallax offered challenging material, thoughtfully juxtaposed aesthetics, and excellent performances from the dancers. For this viewer, the show was not an insignificant commitment. My evening lasted two hours from the moment I sat down at 7:20 p.m. with a program in hand, to when I stood back up at 9:20 p.m. 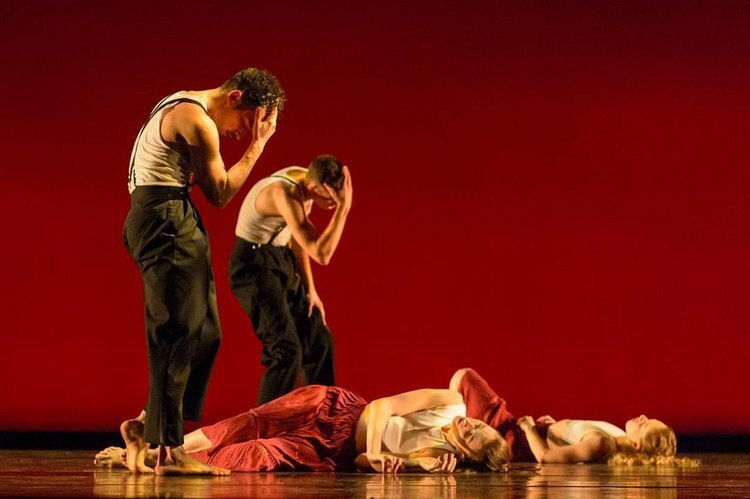 In Charon’s program notes, he emphasized the company’s philosophy that “Dance is for Everybody.” And it’s true, that everybody can appreciate and engage in the thought-provoking, intellectual and durational material such as that presented here. However, at a two-hour stretch it’s hardly an easy leap, even for an avid dance-goer like myself. Megan McCarthy in Kelly’s Pantheon. 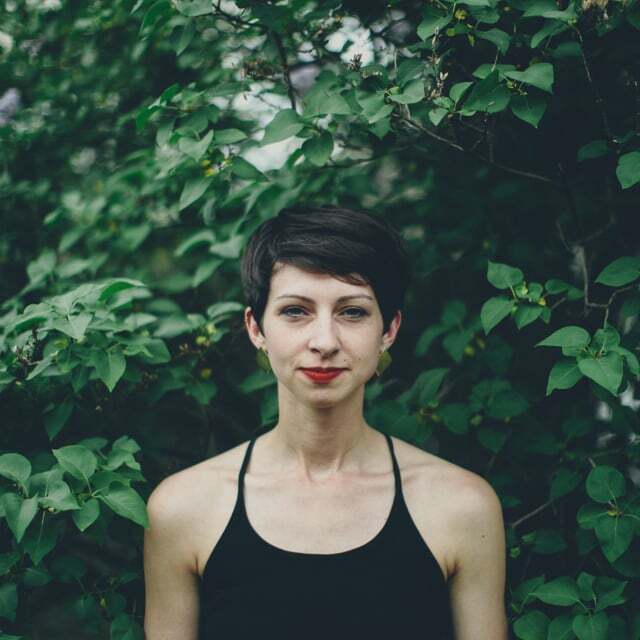 Photo by Stuart Ruckman.